Traveler – Travel Booking WordPress Theme helps you Save Time, Save Money, Save Face, Save everything can Save to make online booking travel: With fully customizable booking form, flexible online payments, automated notifications, earning from Affiliate system, sync with Google Calendar, TripAdvisor Calendar, Airbnb Calendar, HomeAway Calendar. 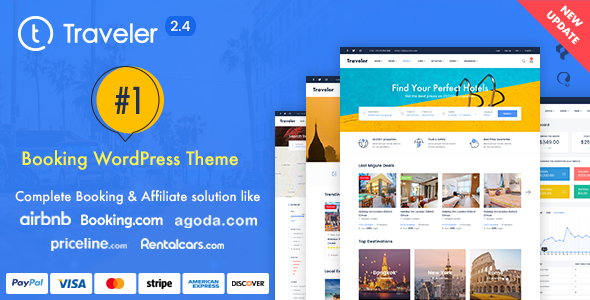 Traveler not just Travel booking theme it is a Booking Engine, designed for a travel website, Marketplace, Travel Agency, Tour Operator, Car Transfer, Activity/Event, Hotel Booking, Room Bnb, Villa Rental, Resort Rental, Flight Booking, Make Affiliate Travel website. Easy to turn On/Off any service you would like to use for your purpose. With 6+ years working on travel products we confident to bring to you best product for your travel site with optimized UX/UI, friendly on mobile on the search engine. – 15 Pre-made demos and continue to update with best optimize UI/UX and get in touch with travel trending in the world. – 400+ Flexible options in Theme Options to help you make dynamic system. – Base on our pre-made demo layout you can define your layout by using many elements built by use to make a system by your way. – Help to make any kind of travel website for tour agency, tour operator, travel blogger, hotel website with booking directly on site or mix all of them on one site. – Help to make Marketplace, allows Partner/Vendor can upload listing for free or paid. – Fully-customizable booking form that can be used on any device with Form Builder build-in. – Form Builder can make various field types (text fields, drop-down lists, multiple choices..), make custom fields required or optional, create many fields as you need. – Multi-items booking with WooCommerce checkout with many add-ons Free to use to make checkout. – Multi-language, compatible with WPML and RTL layout with Arabic languages. – Support Membership functions build-ins, allows Partner/Vendor can buy by a package for upload listing by Free, Paid. – With strongly filterable, sortable and searchable booking list that you can configuration and make the layout on site friendly as you want. – Add Attribute unlimited for each service like make a Category for Hotel, Tour, Car, Rental, Activity, Flight, Hotel, Room. This attribute also embed on filter search advances form. – Support build Advance Search very easy to make searchable stronger. – Support Location post type for build location structure by your way. Included lat&longtidule of google map. – Many services you can use for your travel site and can make On, Off by config: Hotel, Room ( Accommodation), Tour, Rental, Car, Flight. – You can make a Marketplace system or single site for all services above. – Friendly Dashboard for Partner/Vendor, Admin and Buyer. – The Partner / Vendor, who upload listing on the system can manage their profile and online booking calendar, booking history with completed and pending status. – Build-in analytics with booking statistics with the chart, in balance, income. Can make a filter by date for more visually, intuitive. – Invoice manage, system automatic make to Invoice attach to notification email for each booking process. – Vendor, Partner can communication with the buyer via Inbox function before booking. – Refund manage for Admin and Partner/Vendor. Support Refund workflow between Buyer and Vendor / Partner and site Owner. – Automatical detect currency by language when use with WPML plugin with option change language and assign currency for each language system used. – Flexible to make various email templates for notifications by shortcodes build-ins. – Support many major OTA Calendar syncs ( ICal ) like Google Calendar, TripAdvisor Calendar, Airbnb Calendar, HomeAway Calendar. – Can control everything with pricing by date on the calendar. – Can make Tour Package by including Flight, Accommodation, Car.. all in one for client select to book. – Support weather API to display weather info on each location. – Set Discount by date from one to all services on site. – Flexible to make extra pricing for each service on site. Like add more people, laundry, more beds.. any kind of extra price setting you can use, can set required or optional. – Make Coupon for one service or all services for competition with business. – Multi-language support and checked with WPML team. We work directly with this team WPML and confirm point by point for 100% compatible. – With Normal Booking you can use up to 10 payment methods supported: Submit form, Paypal, Paypal Adaptive, Stripe, Payfast, 2Checkout, Skrill, Authorize.net, PayUbiz, directpay.online (DPO) use for almost Africa area. If site owner uses Paypal Adaptive Payment allow split payment to site Owner and Vendor / Partner real time or set delay by the number of times. – The right theme to create an Affiliate system and start earning for Blogger, Affiliater with some OTA we checked: Travelpayouts.com, HotelCombined, Booking.com, Expedia.com, Skyscanner.com. – Integrated by built-ins with Google, Facebook login. Difference register form for normal user and Partner / Vendor user. – MegaMenu integrated by use Visual Composer very easy to use can show for images, icons with nice layout. – Make a review for all services, with some options, allows required booked or no need can make reviews. Each review user can press Like/Unlike for more helpful for visitor. – Multi-currency supported, set one Currency as Primary then with other one make exchange rate with Primary Currency. – Inventory for Hotel/Room to manage and get an overview of booking for all rooms in one place. – Configuration Booking Fee on site by can turn On, Off for match with your purpose. – Wishlist to save all services interested in by buyer ready supported. – Premium support team support answer quickly any questions not clearly.